It is not everyday that you come across a book that moves you to tears and leaves you grappling with a plethora of emotions for days after having finished reading it. Eternal Bonds by author Manoj Singh was one such read for me. After Veronica decides to die by Paulo Coelho, this is one book I was not able to complete because of the powerful emotions at play in the narrative. Bringing together emotions, drama and family discord the author depicts the fragility of human relationships very beautifully. And at the same time, shows us how blood is thicker than water. There are some bonds in life which are always repaid and never asked for anything in return. Family is one such bond. 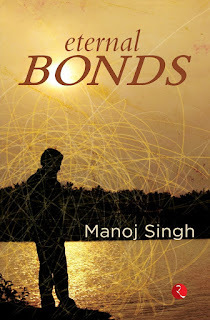 The author, Manoj Singh talks about such deep bonds here through the story of Amit. The characters are poignant and real to an extent that their pain is palpable. Page after page as you witness the atrocities of life they undergo you are reminded of great writers like Munshi Premchand and Saadat Hasan Manto whose stories talked about the harsh realities of life and always left the reader teary eyed. The ugliness of life is not easy to witness at such close quarters. The author has a style with narration, as he has the magical ability to pique the reader's ability to an extent that one is highly anticipating the next move of the story and immediately drown you in a sea of emotions leaving you confused about your own feelings for a while. Set in Jabalpur, with characters that seem so perfectly carved out from the local setting the story has a life of its own. Certain scenes have such immensely powerful imagery that you cannot help but take a break from reading to gain control over your emotions. One could always argue for the need of some lighter moments to help a reader sail through easily however that does not take away the beauty of the story-telling so vividly done in this book. The book does turn bleak and depressing at some junctures where you badly want it to end on a positive note but then, as it is said, such is life. If you look at it from one angle, it is beautiful and if you change the angle, you might find it ugly. Not to take away anything from the author, would have really liked it if the translator of the book was properly credited for it. At some places, the story did feel lost in translation but otherwise, overall it is an impeccable work of art. The story telling, the poise in the narrative and the reality quotient of the characters making it an engrossing read. The story of Amit makes you wonder if it is fair for life to be so unfair to someone while someone else has the best of all that life has got to offer. It may make you feel lucky about how blessed you are or worse, remind you of all the things lacking in your life at the moment leaving you feeling morose. Need to add a bit of warning here - this book can turn your mood off and lay heavy on your emotions for long after you have finished reading it. Overall, an extremely moving account of a life that remains largely untold. Recommended to understand the finer nuances of life which otherwise go largely unnoticed and misunderstood.